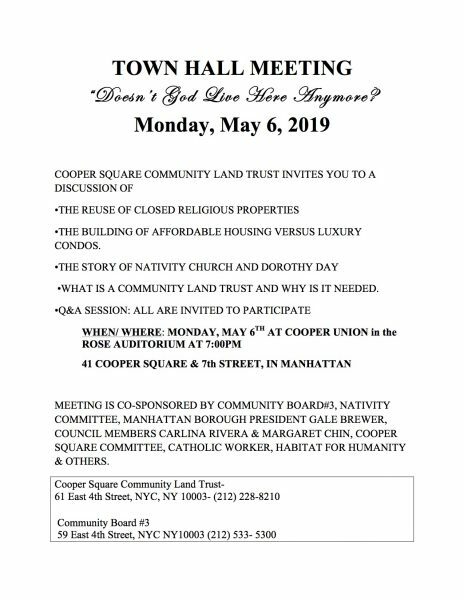 We are writing to invite you and members of your Community Based Organization to join us at a Community Town Hall Meeting on May 6th 2019 on the Disposition of Catholic and other religiously owned and closed properties, currently slated for luxury housing development. This Town Hall meeting is being Co-sponsored by the Cooper Square Community Land Trust and Community Board #3, the Manhattan Borough President, Habitat for Humanity, Cooper Square Committee, Council Members Carlina Rivera and Margaret Chin, and a number of other political representatives and organizations. 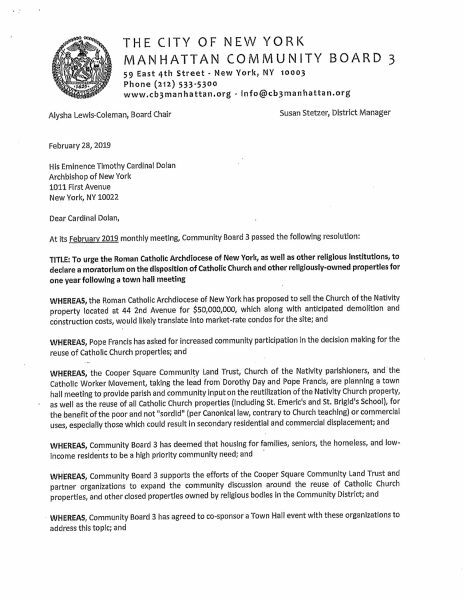 In addition to a motion agreeing to co-sponsor the Town Hall meeting, CB#3 also passed a resolution urging the NY Archdiocese, and all other religious institutions in our neighborhood to agree to a one-year Moratorium on the Sale of any religiously-owned decommissioned property from the date of the Town Hall meeting, to give us time to develop alternative development options..
We are extremely concerned about the loss of houses of worship, community centers and schools leading to the secondary displacement effect of the sale of religiously-owned properties for redevelopment as luxury condos on poor and working class neighborhoods and communities of color. 1. Churches and other places of worship and schools being sold for luxury condos. A focal point of discussion will be the closed Nativity Church, which is closely identified with Dorothy Day, co-founder of the Catholic Worker movement and currently in the process of canonization by the Catholic Church. However, on our list we include a number of other buildings including St. Brigid’s School, St. Veronica’s on Christopher Street, and the People’s Church on East 111th Street and St. Rose of Lima School on West 164th Street. 2. Political/ Legislative Initiatives to Support and Benefit Communities and Faith-Based Institutions and deincentivize sales for luxury condos. 3. 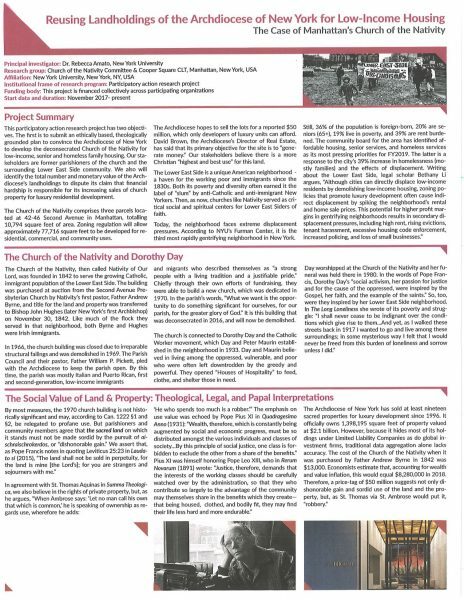 Towards a New Relationship between Communities and Religious Institutions: The Case of Community Land Trusts. The purpose of the Town Hall meeting is to allow our community, in addition to parishioners and congregations of the NY Archdiocese and other institutions, to have a say in the disposition of decommissioned religious buildings. We recognize the good that religious institutions do for our community, but they have a moral obligation to avoid doing harm. 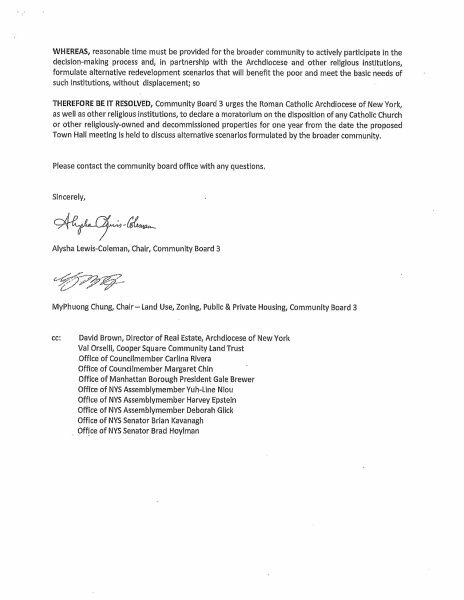 Attached please find copy of the CB#3 Resolution endorsing the Town Hall meeting. Please let us know if you would like to have your Community Based Organization added to the list of Co-Sponsors. We also would welcome your joining with us to help plan and structure the first public discussion on the reuse of religiously-owned decommissioned properties, including churches, temples, community centers and schools. For further information please contact the Cooper Square Community Land Trust at (212) 228-8210, X108 or Community Board #3, at 533-5300.